Baseball's "Rule 21" officially excludes any Major League Baseball player from betting on the World Series, but that doesn't apply to you and me. That is the particular baseball rule which is posted in MLB locker rooms and dugouts which states that, "Any player, umpire, or club or league official or employee, who shall bet any sum whatsoever on any baseball game in connection with which the bettor has a duty to perform shall be declared permanently ineligible." Shoeless Joe Jackson and 7 other members of the Chicago White Sox playing in the 1919 World Series were banned for life from professional baseball for breaking this rule. But did you know there are few rules which actually promote legal online World Series betting in the United States? The Federal Wire Act of 1961 was established to prohibit the processing of gambling transactions through electronic technology. More than 50 years old, the law recently received a reversal opinion by the powerful Department of Justice, who claimed that this should only apply to sports betting. How does that help you legally bet on the World Series and other Major League Baseball contests? Because in conjunction with the Professional and Amateur Sports Protection Act of 1992, it seeks to govern US-based and US-managed companies offering sports betting, and processing transactions. When the UIGEA came along in 2006, the move by smart online sportsbook owners to legitimate offshore Internet gambling jurisdictions assured that US sports bettors can legally bet the World Series online. But before you rush off and click on a link to any old offshore sportsbook, you need to know something very important. Not all international sports betting sites which support World Series betting are created equally. You should still identify those legal baseball betting sites which are regulated and have years of experience in running a first rate, reputable operation. As industry analysts in the sports betting field, as well as World Series bettors living in the United States ourselves, we have identified the top rated sites which are legally licensed for Internet sports betting. If you are wondering just how we qualify a particular web operation as one of the best World Series betting destinations online, keep reading. We mentioned some very important pieces of US legislation which dictate where you have to go online to legally bet on the World Series. If the federal authorities in the United States ever legalize online sports betting, as delivered by USA companies, we will update our website immediately. But currently, you must head "offshore" to enjoy legal betting on the World Series, regular-season Major League Baseball games and popular sports leagues like the NBA, the NFL, the NHL and the PGA tour. Just remember to focus on legal licensing. If you are unsure whether a particular sports betting site's licensing is respectable and legitimate, just click through one of the links we provide here on our site. We will never recommend a sports betting site where we ourselves do not hold accounts and have action. That is because we only frequent sportsbooks which have obtained certification in online gambling jurisdictions which are respected around the world. Some of the most reputable and dependable sports betting destinations are located in Costa Rica, the United Kingdom and Canada. The governments in those locations have created legal online gambling industries, and qualify which websites can or cannot legally offer Internet sports betting options. For safety, security, exclusivity and the best all-around experience, stick to the legally licensed World Series betting sites we recommend and your experience will always be world-class. Bovada is considered the #1 sportsbook for US players and is well known for being extremely honest and trustworthy. As a matter of fact they've never missed a payout since their inception. And when it comes to betting on baseball and the world series, Bovada offers more lines/odds than nearly every other site online. This gives players a lot more flexibility in terms of creative bets they can make. At the sites below, you can access 24/7/365 online World Series betting action. This includes World Series futures and props bets, as well as wagering on the Major League Baseball regular season and playoffs. All of the sites listed below deliver excellent welcome bonuses and frequent player rewards, and they enjoy legitimate and legal licensing as well. Your security and dependability is guaranteed, you can enjoy live in-game betting on a wide variety of sports, and lightning quick mobile access from your smartphone or tablet. American Express. Just the mention of that brand probably has you thinking things like ... respected, reputable, exclusive, admired and world-class. That is because the American Express card was created to cater to the top 1% or 2% of credit card holders in the world. That exclusivity, coupled with decades of experience in delivering the most dependable and desired financial vehicles in the world, identifies the American Express cardholder as one of the most creditworthy individuals in the world. The same holds true for sportsbooks like Bovada, BetOnline, BookMaker and SportsBetting.ag. Each one of those online World Series betting sites has been in operation for more than two decades. And also like American Express, you can identify an intelligent and discriminating sports bettor through his or her association with these legal online sportsbooks. 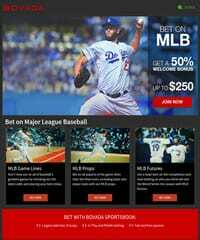 Aside from more than 20 years of online gambling experience, these companies are identified as world-class virtual bookmaking operations because of reputation, convenient and dependable banking options, excellent lines and odds for legal MLB baseball betting and all other sports, and innovative features like live in-game betting and mobile smartphone and tablet access. That is how we identify the best World Series betting sites on the entire Internet. They have to continually outperform the competition in the many important areas we just discussed. There is a reason why you will find our analysts holding accounts at the particular sportsbooks we have reviewed and recommend. They are simply the best of the best, the "American Expresses" of the Internet sports betting industry. Two of the best pitchers in the MLB, Chris Sale and Clayton Kershaw, only lasted four innings, and a 3-run homer by Eduardo Nunez in the bottom of the 7th off Alex Wood in relief pitching duty all but sealed the Dodgers fate in Game 1 at Fenway. Red Sox SP David Price allowed only 2 runs in 6 innings, but it was the 3-run 5th inning allowed by Dodgers SP Hyun-Jin Ryu and three scoreless innings pitched by the Red Sox bullpen that gave the team a 2-0 series lead with the series heading to Los Angeles. The longest game in World Series history, clocking in at 7 hours and 20 minutes over 18 innings, ended when Max Muncy homered off Nathan Eovaldi to give the Dodgers their first win of the series. The Red Sox came back to tie the game in the 8th inning after being down four runs and blew the game wide open with a 5-run inning including a bases loaded, 3-run double from Steve Pearce in the top of the 9th to put the team within one victory of winning the World Series. David Price returned to the mound, allowing only 1 run to Dodgers in 7 innings pitched, and Steve Pearce hit 2 home runs, a 2-run homer off Clayton Kershaw in the 1st inning and a solo shot off Pedro Baez in the 8th inning, to give the historic 108-win Red Sox their 4th World Series title in the past 15 years. Here are the World Series results from this decade. 2010: San Francisco Giants won 4-1 over the Texas Rangers. ESPN World Series Coverage - Their main MLB baseball section covers the latest about what teams are in the hunt for the playoffs, and excellent coverage during the world series. MLB.com World Series History - Offers a complete history of all World Series going back to 1903.